The geekiest coffeehouse around had a very shiny visitor last Friday, May 17! We were very gorram excited when Nathan Fillion (who played Capt. Mal Reynolds in Firefly and Serenity) and his brother Jeff stopped by Wayward Coffeehouse for a late morning coffee and to check out our little corner of the geek ‘Verse! 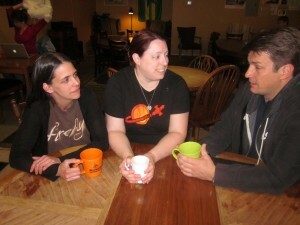 They were both very kind and affable and seemed to enjoy our multitude of Firefly/Serenity and other geeky memorabilia. Thank you Nathan and Jeff for stopping by! Nathan generously left behind some signed t-shirts which will be being auctioned/raffled off for charity at Wayward by our friends the Seattle Browncoat Charities. Keep an eye out for details on when those signed shirts will be offered!